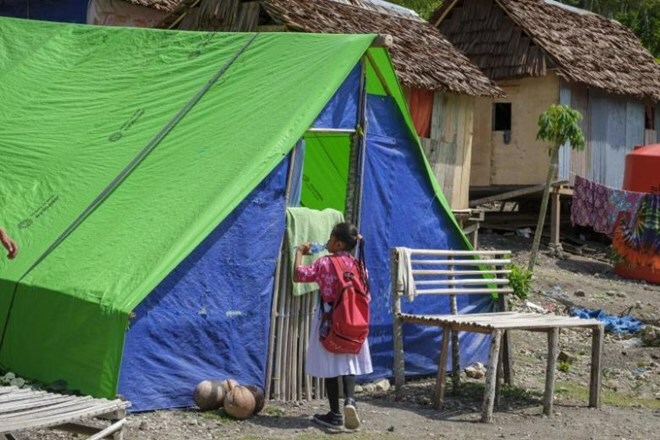 Jakarta (VNA) – Some 6,000 children are still living in makeshift shelters six months after a devastating earthquake and tsunami hit Indonesia’s Palu city. At least 170,000 residents from Palu and surrounding districts are still displaced, and entire neighbourhoods are still in ruins, although life has returned to normal in other areas of the city. Monsoon rains have fanned outbreaks of malaria and dengue fever while residents in hard-hit areas have been forced to navigate open sewers and mounds of sharp rubble. In addition, the force of the 7.5 magnitude quake saw entire neighbourhoods leveled by liquefaction. The Red Cross said recovery has been painfully low and often complex. According to Christophe Bahuet, the UN development agency’s Indonesia representative, people in the affected areas need a regular source of income to sustain themselves and regain a sense of normalcy. The severe earthquake and subsequent deluge razed swathes of the coastal city on Sulawesi province on September 28 last year, killing more than 4,300 people, injuring 11,000 others and driving 83,000 from their home. Damage bill in Palu topped 900 million USD.